What a month! Mama.ie has been taking a back seat because I am working behind the scenes with my fellow bloggers to organise the first ever dedicated Irish Parenting Blog Awards. The seed of an idea for the awards came about last year during the run up to the Blog Awards Ireland event in October. We had to do a little campaigning to get a Best Parenting Blog category added to the awards. For a while it seemed people weren’t convinced that there were enough parenting bloggers to warrant our own category. We knew better though – our group has been growing steadily since 2012 when I set it up. In the end we got our category – and I was delighted to come away with an award! We enjoyed a great night out and I think it’s safe to say that the Irish Parenting Bloggers were the rowdiest bunch in the place at the award ceremony. So when we learned in January that the Blog Awards Ireland event wouldn’t be happening in 2015, we immediately considered organising our own peer awards. The timing couldn’t be better. Back in December when I was laid up with my leg, I spent my evenings putting the finishing touches to the Irish Parenting Bloggers website. Bloggers can now register for the site and then set up their own directory listing pages. 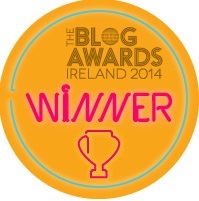 It didn’t take long to add a new section to the site for the Irish Parenting Blog awards. We’ve given bloggers until the end of this month to register for the site if they want to be included in the awards, so I’ve been kept busy helping everyone get set up. Meanwhile, my fellow bloggers, Mind the Baby, At the Clothesline, The Busy Mamas, The Airing Cupboard, Dolly Dowsie, and Raising Elves, have been sending out sponsorship packs, making phone calls, organising venues, and keeping everyone informed via Facebook and Twitter. Thanks to them, we have formed a great partnership with Glenisk, the headline sponsors for the awards, as well as securing sponsorship for seven of our nine award categories. And there’s still two months to go before the big night! These women constantly blow me away with what they can achieve. Talk about a productive month! I have a busy weekend ahead because we’re opening the award nominations on Sunday. Now all I have to do is figure out who to nominate! I’m so excited! It’s been great fun organising it. There’s just such a high standard and volume of Irish parenting bloggers. It’s about time they got the recognition and celebration they deserve. It’s going to be a great night! It’s going to be great Sara!